This has not been a good season for a few of my favorite things here in the Adirondacks. As you can see in today's photo, my favorite car suffered the result of the warm, windy rainstorm we experienced this morning. It was one of my not-so-prescient moments when I stood watching out the window, marveling at the storm, as my second favorite tree swayed madly in the wind. I was shocked when I realized it was suddenly toppling down directly toward me. This tree was a beautiful white birch whose bark caught the late afternoon sun perfectly. 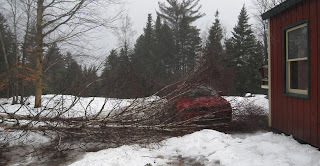 Some of my readers may recall the demise of my favorite balsam back in December. Now my favorite car and second favorite tree get it. A word of warning to my other favorite things might be in order!